SOLO [Structure of Observed Learning Outcomes] Taxonomy is a concept originally designed by Biggs and Collis (1982) which describes the level of engagement that a learner has with a concept, idea or subject area. Learners should be supported to make connections in their learning between texts they’ve read, information they’ve learned and problems they’ve solved. SOLO taxonomy is designed to promote depth in learners’ reflections and develop Higher Order Thinking Skills (HOTS). One strategy which can be used to develop SOLO in the classroom is the Hexagonal Approach. When reading a text, e.g. 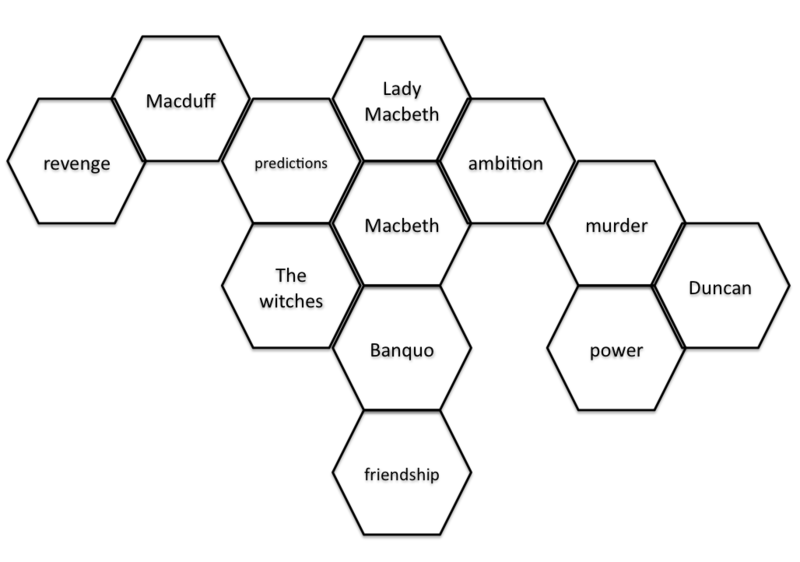 Macbeth, learners can be provided with, or pull out, the key information/characters and write these on blank hexagons. Working independently, or collaboratively, learners can then join the hexagons to make connections. It is important that learners are given time to reflect and describe the connections they have made. An excellent task to strengthen listening and talking skills, with the possibility of leading into the creation of texts. CLICK HERE for a brilliant free resource developed by Pam Hook at HookED. Type in the words/phrases that you want included in your hexagons, and this will generate a document which can be printed out, cut out and organised by learners. This concept is suitable for First Level, onwards; however, with support, the foundations can be developed in Early Level.